Type: Ojibwe-style graphic overlay wedding ring, with cut-out designs in both exterior and interior (the Life Road and a stylized bear paw); organic (sculptural) finishing by means of melting and hammer-texturing. Width: 0.394 in (10 mm). 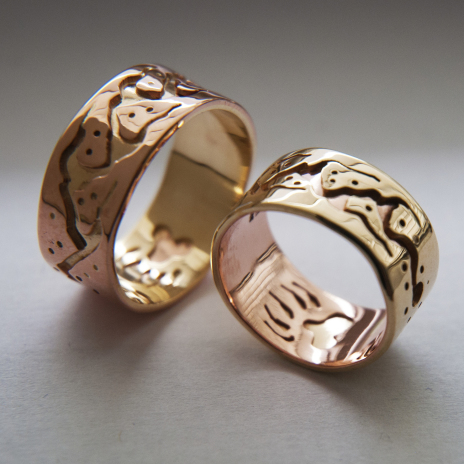 This gold ring set can also be ordered executed in sterling silver. The above wedding bands are also custom-available in different widths and gold and/or silver color combinations. If desired, it is also possible to make the rings in a non-organic, sleek design, executed with smooth surfaces and straight edges. The above wedding rings show a cut-out design of the Midewiwin Life Road on the outsides, and a stylized bear paw on the insides. 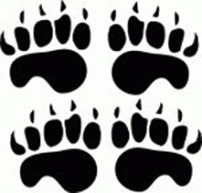 Nooke doodem, the Bear Clan, is the most numerous of the warrior clans of the Anishinaabe Peoples. To the Ojibweg, Oodaawaag, and Bodéwadmik, Makwa the bear is a powerful and respected bawaagan (grandfather-appearing-in-dreams), who chose the earth walk as a spiritual leader in order to show the People the way into the dream world and teach their mashkikiiwininiwag (Medicine People) the medicinal use of herbs. As bears personify their lodge, members of the Midewiwin follow makomii “the bear path”, which contains certain rituals in order to advance from a lower to a higher degree in their Society. According to Midewiwin, the bear personifies their Lodge; it is Makwa who guards the eastern door of the Midewigaan, the ceremonial lodge of the Midewiwin, as he protects the healing ceremonies and sacred rituals that are being performed inside the lodge.